In a bit of a first here on Chasing Amazing, after struggling so tremendously in finding a relevant Guardians of the Galaxy post to make this past Friday, I’ve decided to put together a more reactive article about a character that was (unexpectedly) featured in the movie over the weekend. So let this introductory paragraph serve as your spoiler warning now if you haven’t seen Guardians of the Galaxy yet or if you haven’t already been spoiled on the surprise appearance in the mid-credits teaser. Because seriously, if you had money on Howard the Duck popping up in the Marvel Cinematic Universe in Guardians of the Galaxy, I want you to also pick some lotto numbers for me and predict the next 10 Super Bowl winners. If you’re a bit puzzled as to why there are some people losing their minds over a cranky talking duck, it might be a generational thing. The big Howard the Duck comic book craze actually took place a few years before I was born, but for those that are even younger than me, you have to trust me when I say this guy was a total phenom. It’s not every day that a comic book character gets a few thousand write-in votes in a presidential election, but that’s exactly what Howard did in 1976. My first exposure to Howard came in the mid/late 1980s when the Howard the Duck film played on loop on HBO. I’m going to guess this was probably around the summer of 1987 as the film was originally in theaters the summer before. I was way too young and my tastes too unrefined to grasp what a total abomination this film was – that would come in time. For me, it wasn’t until many years later when I read some of the original Steve Gerber Howard the Duck comics. For the uninitiated, Gerber may be one of the most important figures in the fight for creator rights outside of Jack Kirby and Steve Ditko. As a writer, he was tremendously eccentric, as well as frequently tardy with his scripts, which led to him being fired from the book he wrote and edited in the late 1970s. But it was his subsequent battle with Marvel over the usage of Howard that indirectly led to the creator-ownership revolution that has come to define the comic book industry over the past 25 years. Meanwhile, Gerber’s Howard the Duck was incredibly complex and unique – unlike anything I’ve ever read before in a comic book. I don’t know exactly if that’s a good or bad thing, but it’s unquestionably different. For example, in one issue (Howard the Duck #16), Gerber was late filing his story again, so rather than publish a reprint, he filled his comic with long-form essays about the art and craft of comic book writing. 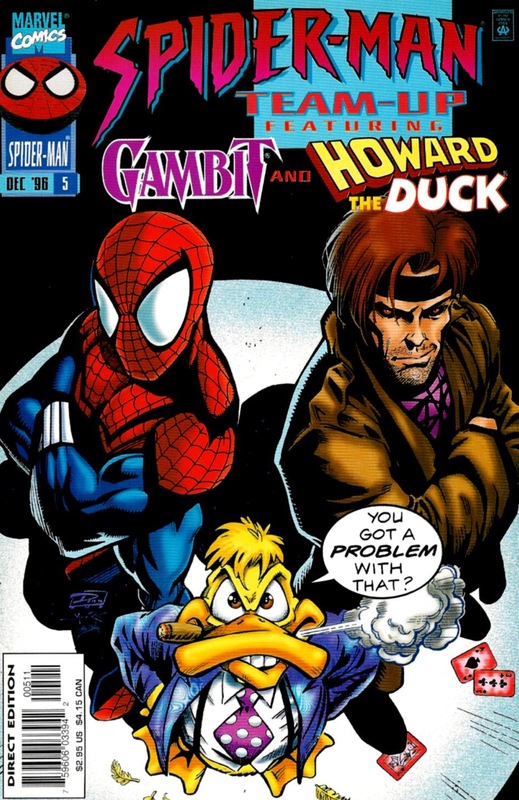 For two characters with absolutely nothing in common, Spider-Man and Howard had quite the shared history, with Spidey showing up in the very first issue of Howard the Duck, and Howard in turn teaming up with the Web Slinger in Marvel Team-Up #96. The MTU issue is totally insane and involves the two “heroes” fighting a villain named Status Quo who is trying to destroy all fads. And that’s a fairly tame Howard story. This 1996 issue of the short-lived Spider-Man Team-Up series is actually quite significant for a number of reasons. For starters, it marked the first time Gerber worked on Howard since his ungraceful exit from Howard the Duck in the late 70s. 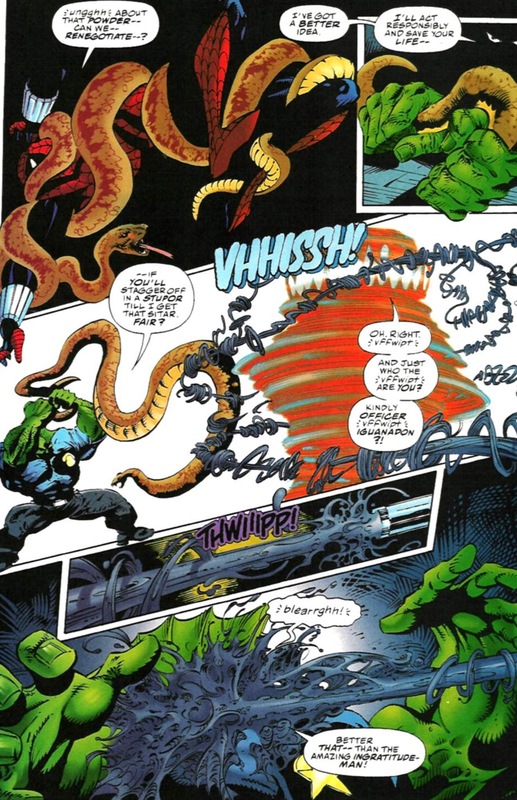 Per the condition of Gerber’s agreement with Marvel, he would write the comic only if he could weave in two independent properties: Savage Dragon (from Image Comics) and Destroyer Duck (which was actually the faux version of Howard Gerber created with Kirby after he was fired). The historic nature of this collaboration aside, the team-up takes place towards the latter half of the infamous “Clone Saga” when Ben Reilly was functioning as Spider-Man, but Marvel had also brought back Peter Parker as a means to eventually transition the Spider-books back to the “original” Spidey. 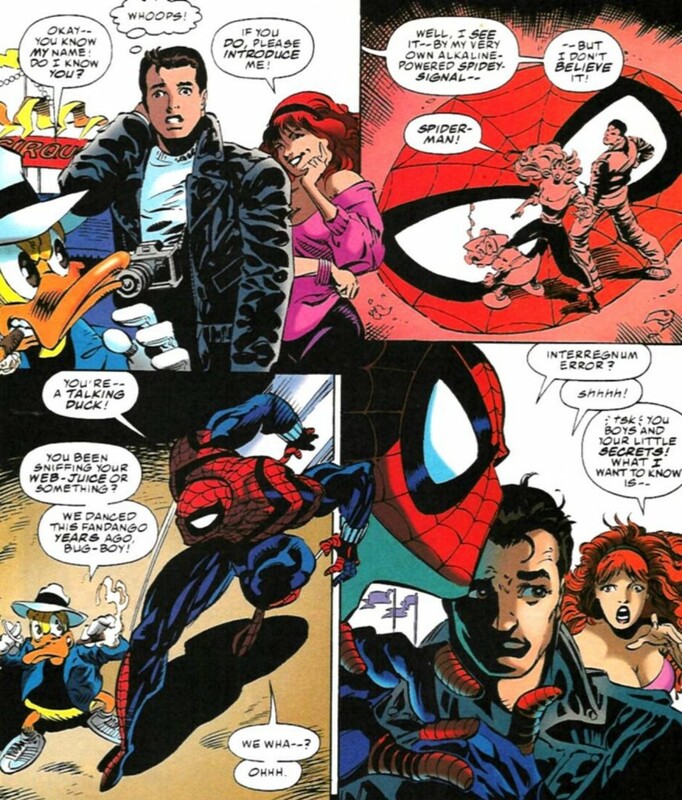 Outside of one little exchange where Peter, out of costume, recognizes Howard but the duck has no idea who the guy is, while Spider-Ben is all confused by a talking duck and Howard is offended that they don’t remember their last pairing, that’s about all the “Clone Saga” factors into this story (a part of me thought Gerber might have pushed the stupidity of the whole clone concept a bit further, but no dice). 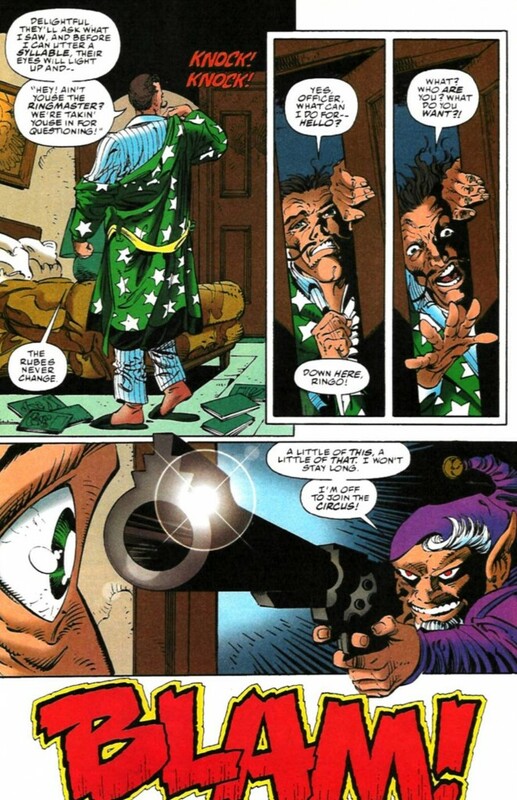 Meanwhile, Gerber just runs through all of his tricks and gimmick in this comic, from roping in the classic Marvel villain the Ringmaster (who also played a role in the original Howard the Duck series), to actually reintroducing his most famous assassin, Elf with a Gun (from Gerber’s amazing Defenders run). Somehow, Gerber manages to tie all of these wacky ideas and characters together by having the Elf attempt to murder Ringmaster, while Peter and Ben fly to Cleveland to investigate (because … why not). And since Cleveland is Howard’s hometown, instant crossover. I’d by lying if I said this was some kind of lost Spider-Man classic from the mid-1990s (if there ever was such a thing), but it’s such a tremendous amount of fun, especially if you’re a fan of Gerber and his original work on Howard and Defenders. Marvel was starting to find itself in a real bad place during this time period, so in a weird sort of way, the company was more inclined to take risks and bring a personality like Gerber back on board and give him total control of the store for an issue. I doubt it did much to lift the company out of its financial malaise, but hey, at least people like me can reminisce about the comic in question. Soooo, how does Gambit play into this issue? That is him on the cover, right? LOL… whoops… Spider-Man Team-Up was anthology sized, so each issue contained two full-size team-up stories. The first was a generic team-up with Gambit, but this comic is infinitely more famous for the Gerber-written Howard team-up. It’s cool, Mark. I was just curious reading your summary wondering when Gambit was going show up in the story and being surprised to see Savage Dragon instead. I remember this one well – if memory serves correct a shipping delay meant it wound up being the last ever Ben Reilly Spider-Man story published. But it also sparked another row between Gerber and Marvel. Gerber (who had previously used Howard in She-Hulk although I think that was during the period John Byrne retconned away as a dream) had signed up assuming this was a one-off so he was annoyed to find Marvel suddenly using Howard a lot with other appearances in Ghost Rider, Generation X and even a Christmas special. Consequently Gerber retaliated by using the crossover to have Howard cloned with a clone walking away in the Marvel issue while a duck who donned glasses and dyed green feathers called “Leonard the Duck” was pulled out in Image to enter the witness protection programme as a completely creator owned character whilst the other duck to walk away was dismissed as a soulless clone “they’ll never know the difference”. Marvel were not amused and editor Tom Brevoort refused to work with Gerber ever again. However by the early 2000s Gerber did a Howard limited series for the Max imprint. Howard had also been subject to a lawsuit by Disney that forced a redesign, most notably including trousers. That odd cover angle is probably one result though in the comics he often defied the rule depending on who was paying attention. I don’t know if you actually care about spoiler warnings (I don’t) but the one here is… very ineffective. Your splash image is Howard the Duck and your first paragraph mentions “a surprise appearance”in Guardians of the Galaxy; it’s impossible not to put 2 and 2 together at that point.